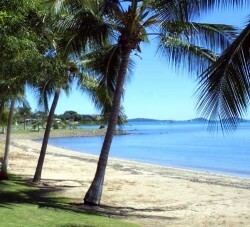 In the past the coastal resort township of Airlie Beach was a haven for backpackers and cheap hotel acommodation. Nowadays, however there is a lot more variety when it comes to places to stay. The backpacker hostels and cheap hotels are still there, but they are quickly being outnumbered by numerous luxury holiday resorts and fully self contained family apartments. To get to the Queensland holiday desintation of Airlie Beach you can either take a leisurely drive up the east coast of Queensland, or alternatively save a lot of time by flying on any of the daily flights that travel to the region from all over Australia. If you want to get more information about driving or flying to the Airlie Beach region then you should click here. The best times to travel to Airlie Beach is between the months of April and November, when the average maximum temperature ranges from 23°C to 30°C and the rainfall in minimal (less then 10 rainy days per month). However, from December through to March Airlie Beach will experiance more tropical weather with warmer temperatures, high humidity, significantly more rainfall and the possibility of tropical cyclones impacting of the mainland area. Airlie Beach is ideally located on the Queensland coast, surrounded by the Conway national Park and is the gateway to the popular Great Barrier Reef and Whitsunday Islands. In order to see a list of some of the many things that you can see and experience whilst staying in Airlie Beach then you can click here. Airlie Beach Hotel - Airlie Beach Hotel Motel accommodation in the heart of Airlie Beach, Whitsundays, providing discounted motel & hotel accommodation,close to the Great Barrier Reef. If you are looking for a central location right on the Esplanade and overlooking the Airlie Beach lagoon then you can't go past the Airlie Beach Hotel. Guests can explore the many features of this coastal village, the numerous mainland attractions as well as the vast array of day tours to the Great Barrier Reef and the Whitsunday Islands when they stay at the Airlie Beach Hotel. Airlie Beach Motor Lodge - The Airlie Beach Motor Lodge offers a range of budget motel, studio apartments & 2 bedroom self contained townhouses providing discount beach holiday resort accommodation. Whether you are an adventurous type, an active family, or a couple looking for a romantic trip away the most difficult part of staying at this property is deciding what to do. Set apart from downtown Airlie Beach, yet within a few minutes walk, the Airlie Beach Motor Lodge is the perfect haven to refresh after fun in the Whitsundays. Coral Sea Resort - The Coral Sea Resort in Airlie Beach, Queensland is an absolute beachfront Whitsundays hotel and resort accommodation. It provides ideal Great Barrier Reef holiday accommodation at discount rates. The resort has an extensive array of fully equipped conference, exhibit space, meeting, banquet and wedding facilities that feature picturesque ocean views for up to 300 guests. Combining first class facilities with award winning legendary hospitality, the Coral Sea Resort accommodation is one of the most appealing deluxe luxury resorts in the magical Whitsundays. Whitsunday Terraces Resort - The Whitsunday coast and surrounding islands are a beauty to behold. The numerous islands surrounded by azure waters and coral reefs, balmy breezes and a myriad of exciting activities makes this the natural holiday play ground. The Whitsunday Terraces Resort offers panoramic views of the Whitsunday waters and to the picturesque islands beyond. As a reflection of the high standards of the resort, the Whitsunday Terraces has been the proud winner of the Whitsunday Tourism Awards for superior accommodation. Club Crocodile Airlie Beach - Club Crocodile Resort Airlie Beach is a multi-award winning tropical resort offering accommodation in Airlie Beach, Queensland. This affordable holiday accommodation is a fantastic base from which to explore not only Airlie Beach but also the Whitsunday Islands and Great Barrier Reef. Club Crocodile Airlie Beach provides deluxe resort style accommodation as you unwind and absorb the laid back atmosphere of tropical North Queensland. Downtown Airlie Motel - The Downtown Airlie Motel provides discount holiday accommodation in the heart of Airlie Beach for the budget conscious traveller. Located right across from the world famous Airlie Beach Lagoon the Downtown Airlie Motel is the perfect accommodation base for your next Whitsunday holiday. Guests are able to enjoy the friendly service provided by this motel, which has everything that you need including a tour desk, espresso bar and fashion shop in the motel complex. Whitsunday on the Beach - The budget accommodation that the Whitsunday on the Beach provides holiday makers is ideally positioned in the heart of Airlie Beach, Queensland. This great location makes the Whitsunday On the Beach the perfect base from which to explore everything that Airlie Beach and the fabulous Whitsundays has to offer. With a friendly and relaxed atmosphere and a central position only a few steps away from the best dining, entertainment and shopping that Airlie Beach has to offer this is the perfect discount accommodation for your next holiday to North Queensland.